Gram atomic mass & Molar mass. First recorded evidence that atoms existed. 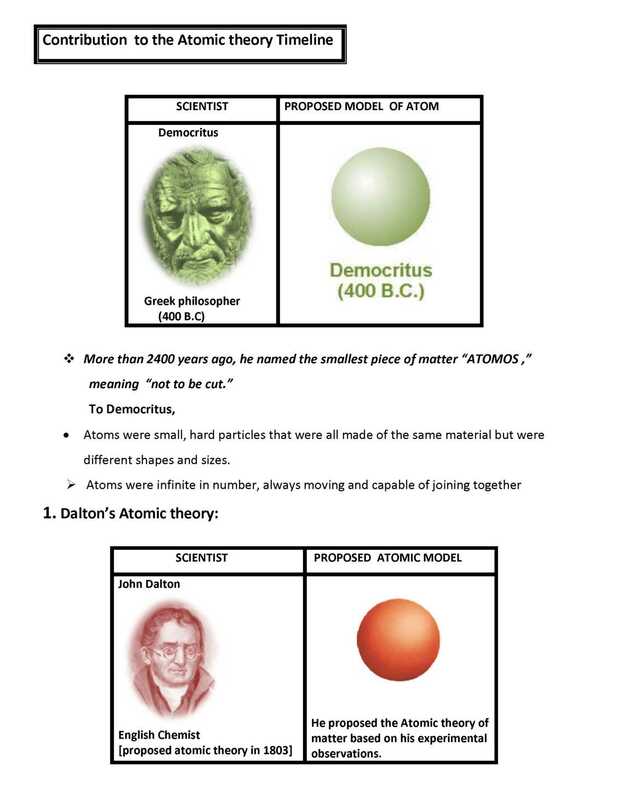 Dalton’s theory was based on the premise that the atoms of different elements could be distinguished by differences in their weights. o The indivisibility of an atom was proved wrong , for, an atom can be further subdivided into protons, neutrons and electrons. 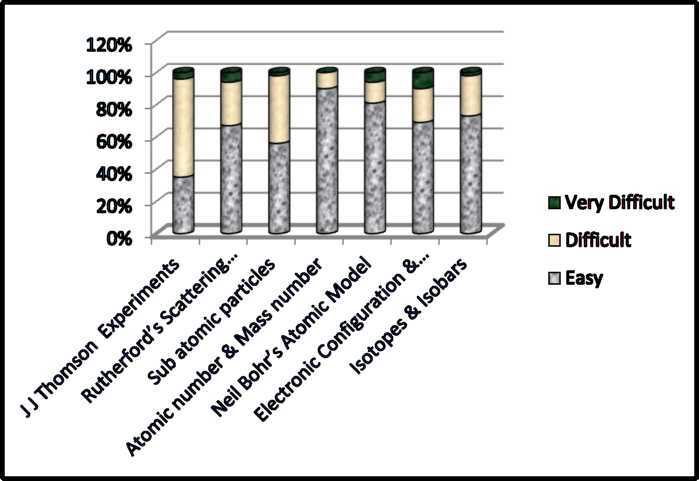 o The atoms of same element are similar in all respects , but isotopes of same element have different mass. An electron is a negatively charged component of an atom which exists outside the nucleus. Each electron carries one unit of negative charge and has a very small mass as compared with that of a neutron or proton. Since the ray was attracted to a positive electric plate placed over the cathode ray tube (beam deflected toward the positive plate) he determined that the ray must be composed of negatively charged particles. E. Goldstein in 1886 discovered the presence of new radiations in a gas discharge and called them canal rays. These rays were positively charged radiations which ultimately led to the discovery of another sub-atomic particle. Canal Rays: The positively charged radiation produced in the discharge tube at low pressure and high voltage are called canal rays. 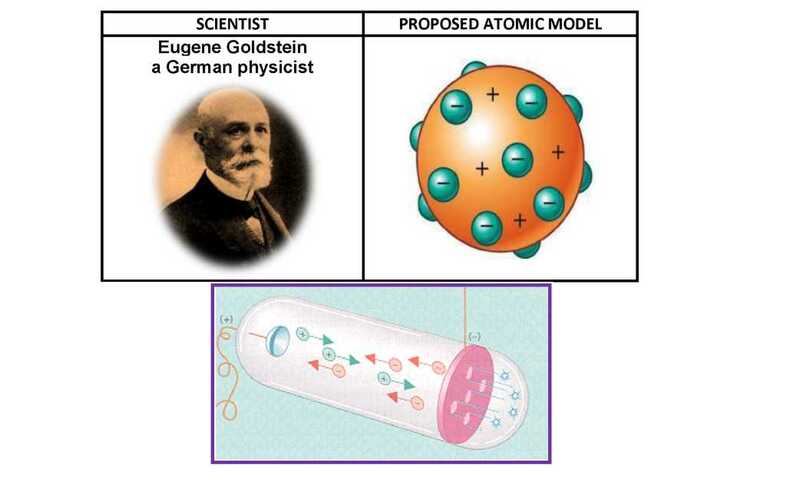 Q.1 What was the model of an atom proposed by Thomson? Q.2 What is the nature of charge on electrons? the gold foil without getting deflected. empty. completely rebound on hitting the gold compared to the total size. Limitation: In Rutherford’s atomic model , Nucleus & electrons are held together by electrostatic force of attraction which would lead to the fusion between them. This does not happen in the atom. 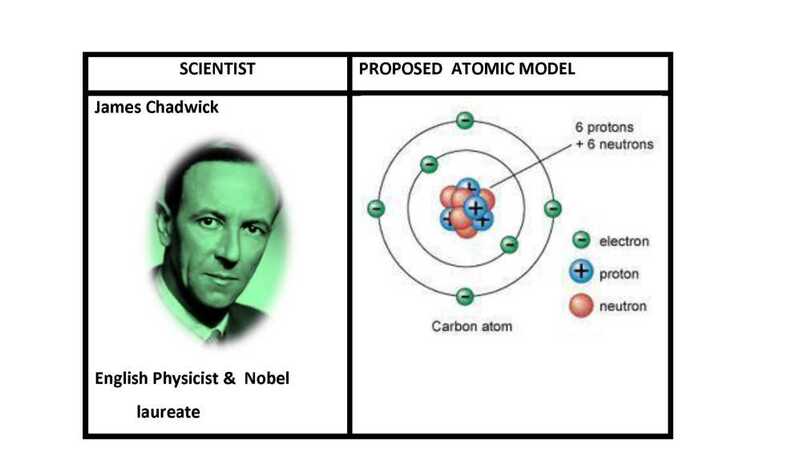 Chadwick received the Nobel Prize in 1935. A neutron is a subatomic particle contained in the atomic nucleus. It has no net electric charge, unlike the proton’s positive electric charge. Q.1 Who discovered the nucleus of the atom? Q.2 What is the charge on alpha particles ? 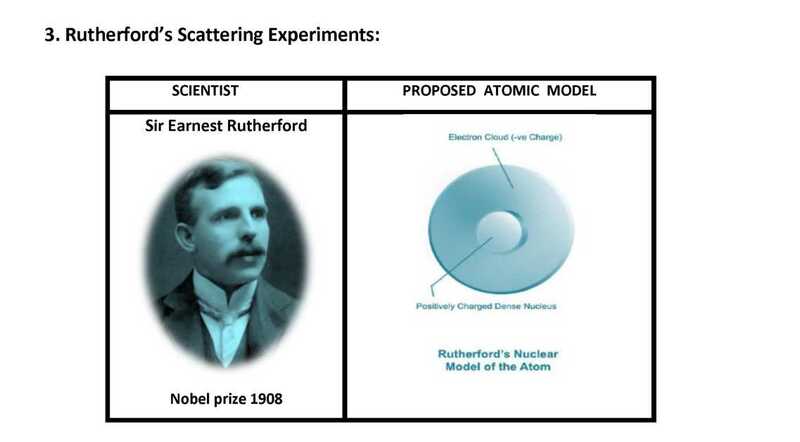 Q.3 Which observation of Rutherford’s scattering experiment established the presence large empty space in atom? Q.1 Why is the relative mass of an electron is taken as negligible ? Q.2 Give the actual masses of electron & proton in kg? Atomic number, Z = Number of unit positive charge on the nucleus = Total number of unit positive charges carried by all protons present in the nucleus. The outermost shell of an atom cannot accommodate more than 8 electrons, even if it has a capacity to accommodate more electrons. This is a very important rule and is also called the OCTET RULE. The presence of 8 electrons in the outermost shell makes the atom very stable. Q.2 Give the representation of three isotopes of carbon which are C-12, C-13 and C-14. Write the names of three elementary particles which constitute an atom. Name the scientist & his experiment to prove that nucleus of an atom is positively charged. Which is heavier , neutron or proton ? *How many times a proton is heavier than an electron? 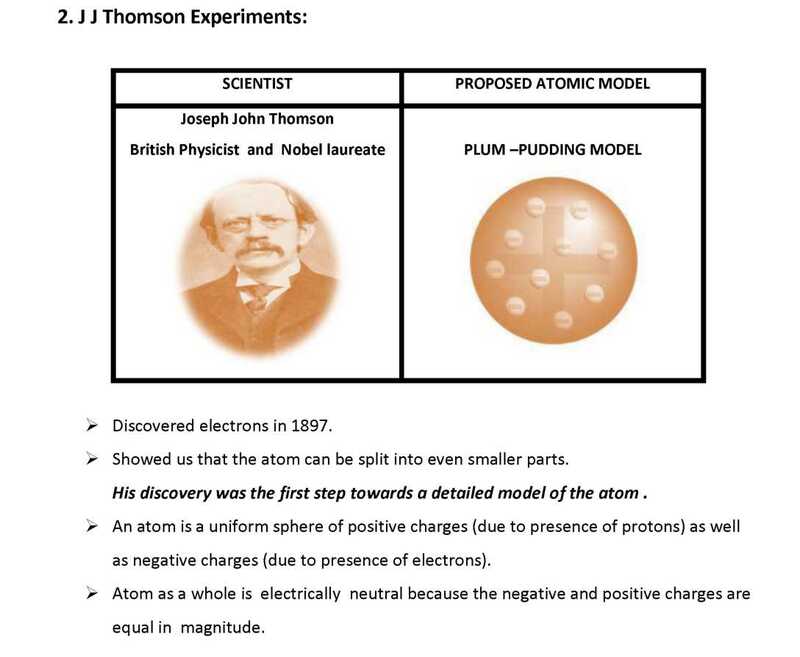 What was the model of an atom proposed by Thomson ? How many electrons at the maximum can be present in the first shell ? What type of charge is present on the nucleus of an atom? *What are iso bars ? Name the particles which determine the mass of an atom. Write the charges on sub atomic particles. *	Give one Achievement and one limitation of J.J Thomson’s model of atom? What are valence electrons? Give example. *Which kind of elements have tendency to lose electron ? Give example. How many electrons are present in the valence shell of nitrogen & argon? State the maximum capacity of various shells to accommodate electrons. Give the symbol , relative charge & mass of the three sub atomic particles. i) Atomic number of sulphur, ii) Mass number of sulphur iii) Electronic configuration of sulphur. Why do Helium has Zero valency? An atom contains 3 protons , 3 electrons and 4 neutrons .What is its atomic number , mass number & valency? *How are the isotopes of hydrogen represented ? *What would be the electronic configuration of Na+ , Al3+ , O2- , Cl –. 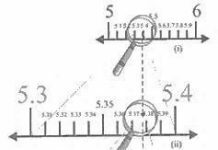 *	a) Give the observations as well as inferences of Rutherford’s Scattering experiment for determining the structure of an atom. Write the main postulates of Bohr’s Model of Atom. The scientists who discovered subatomic particles. Rutherford established the existence of nucleus. Electronic configuration & its relation with Valency. Difference between Isotope and Isobar.